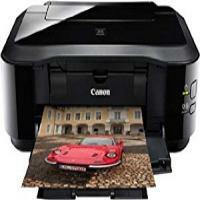 Canon Pixma iP4950 is an advanced photo inkjet printer capable of producing high-quality photos and documents. The printer weighs approximately 5.7 kgs and measures 431 x 297 x 153mm. The printer produces great photos but lacks many of the high-end features like memory card slots, Wi-Fi connectivity etc. The main connectivity of this printer relies only on USB interface. It uses 5 efficient individual Canon Pixma iP4950 Ink Cartridges to produce high-quality printouts. These individual tanks help save money, as one only needs to replace the colour that runs out. Its 2-way paper feeding reduces the amount of time required for changing paper types. It is capable of producing stunning quality photos from high definition movies. It is capable of producing photos directly from compatible digital cameras using PictBridge technology. Canon Pixma iP4950 printer is ideal for photographic printing as well as text documents. It is more suitable for professional print users than casual home users. It uses 5 individual high-yield Canon Pixma iP4950 ink cartridges to produce high-resolution outputs of 9600 x 2400 dpi. This device lacks many of the advanced features like memory card, Wi-Fi connectivity, and only features USB capabilities. This may be troublesome if one wants to print from multiple devices. However, its compatibility with operating systems like Windows and Mac makes it a reliable printer. What should I do, if I am not able to print properly from the digital camera? The following are the possible errors that might occur when you try to print directly from a digital camera or digital video camcorder. There are few countermeasures described to eliminate them. The paper output tray is closed. Open the paper output tray to resume printing. The Inner cover is open. Close the inner cover and select Stop in the display on your camera to stop printing. The printer has a built-in waste ink absorber to hold the ink used during the print head cleaning. This error message indicates that the waste ink absorber is nearly full. You can still print for a while by selecting continue on display of your camera. However, printing will become disabled once the waste ink absorber is completely full and until the waste Canon Pixma iP4950 Ink Cartridge is replaced, you are recommended to contact the customer care service as early as possible to get the problem resolved. How to resolve ‘No Ink’ error message? The ink tank may not be installed correctly in the printer and the alarm lamp flashes orange. To resolve this error install the appropriate Canon Pixma iP4950 Ink Cartridges. The ink has run out. Replace the ink tank, and close the top cover unit. If printing is in progress and you want to continue with your printing, select Continue in the display on your camera with the cartridges installed in it. Then you can continue printing under the ink out condition. Replace the empty ink tank immediately after printing is completed as it may damage the printer if printing is continued under the no ink condition. If multiple ink lamps are flashing, check how fast they flash. Fast flashing indicates that ink is empty. Slow flashing indicates ink is low. Canon Pixma iP4950 Ink Cartridges are not installed in correct place, or more than one ink tanks of the same colour are installed. In this case, confirm that the ink tanks are installed in the appropriate positions. The ink tank installed may not be compatible with the printer. Install the appropriate ink tanks. Q. My Canon Pixma iP4950 is unable to print. What should I do now? Make sure that the USB connection between your computer and the printer is proper. If the USB data cable is not connected properly with either of them, the print request is not going to reach the printer. Make sure that the paper tray is not empty. If the paper tray is empty or less filled, fill the paper tray and try to print again. Make sure that the Canon printer is selected as go-to printer. Check the Canon Pixma iP4950 ink cartridges. If the ink cartridges are running out, replace them with the new cartridges. Q. How many individual Canon Pixma iP4950 ink cartridges are available in this printer? A. The printer uses 5 individual Canon Pixma Ink Cartridges to produce high-quality printouts. Q. Is there any memory card available in this printer? A. No, there is no memory card slot available in this printer. Q. How would I come to know whether the Canon Pixma iP4950 ink cartridges at your site, are in stock or out of stock? A. To know whether the ink cartridge is in stock or not, select the product. After that the page opened will let you know the current availability status of the ink cartridges. It might be possible that ink cartridge is out of stock right now. If the product is out of stock or unavailable, “out of stock” is already displayed with the product details. To know further you can also call us on 048 30833221 or email us at info@printerinkcartridges.ie . To look for Canon Pixma iP4950 ink cartridges, click https://printerinkcartridges.ie/canon-inkjet-cartridges/canon-pixma-series/pixma-ip4950 . Q. Does this printer includes Wifi? A. No, Wifi is not supported in this printer, but it has USB interface to connect to your PC or Mac machine. Q. What are the dimensions of Canon Pixma iP4950 printer? A. The printer weighs 5.7 kgs and measures 431 x 297 x 153mm in its dimensions. Q. Can I expect fast print speed from this printer? A. The Canon Pixma iP4950 comes with excellent printing feature and print at the speed of 12.5ipm in black and 9.3ipm in colour. It also supports 2-way paper feeding which reduces the amount of time required on changing the paper types and thus contributes to the overall speed of the printer. A. The printer support all Windows and Mac Compatible devices. Q. How much money can I save if I buy compatible Canon Pixma iP4950 ink cartridges instead of going for the original brand? A. The cost reduces to half or even less if you buy compatible cartridges on this site. We guarantee same quality print results from the compatible ink cartridges as you get using the original (OEM) standard ones. Q. Is there any downside of refilling the Canon Pixma iP4950 ink cartridges by my own? A. Yes, you might face many problems if refilling of the cartridges is not done properly. In fact, if you do it by yourself, it might leave stains on your clothes or in surrounding area if refilling is not done properly. If you do not want to spend much on the cost of the cartridges buying the compatible Canon Pixma iP4950 ink cartridges can be treated as a good alternative in this situation. Q. What type of print media are supported by this printer? Q. How many cartridges come in a 25 cartridge pack? How buying multipacks prove to be a better option than buying the single cartridges? A. We provide set of 5 cartridges each in a multipack of 25 Canon Pixma iP4950 ink cartridges which comprise of CLI-526B Black, CLI-526C Cyan, CLI-526M Magenta, CLI-526Y Yellow, and PGI-525 Black. Yes, buying the multipacks over the single ones is always a good idea as it saves huge on money and is a better option to go with if all your cartridges get empty almost at the same time. Q. Do these Canon Pixma iP4950 ink cartridges leak or dry up if not frequently used? A. Any cartridge whether an original or remanufactured one would dry up if stored for long when not in use. It is suggested to at least use the printer once every month to ensure the flawless working of the printer. Q. How to install the Canon Pixma iP4950 ink cartridges into my printer?